Watch Milwaukee Road #261 from trackside, helicopters and in the cab as she pulls the world-famous New River Trains from Huntington to Hinton, WV. You'll see here the 261 attack the curves and grades in this rugged territory in an old-fashioned, smoke-belching, stack-rapping performance. It's all been captured in the typical Goodheart fashion...precise camera work, a rousing cab ride narrated by Engineer Rich Melvin, aerial views and spectacular scenery! The route of this train goes through the New River Gorge, one of the most scenic parts of America, especially in October when the gorge is ablaze with fall colors! There's even more! Vintage scenes of ex-Reading steam locomotive 2101, C&O 614 and NKP 765 plus side-by-side running of the 765 and Pere Marquette 2-8-4 No. 1225 at the 1991 NRHS Convention. PLUS...you'll see scenes of the rebuilding of the 261 following the 56 minute main feature. 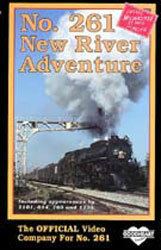 If you have ridden their annual train excursion, here is a perfect souvenir from the steam days. If you haven't ridden a train here, this will make you want to go.